President of Georgia Mikheil Saakashvili discussed the relations between Georgia and Poland during a friendly stroll in the renovated Batumi streets with Polish Foreign Minister Radoslaw Sikorski on July 13. “Mr Sikorski, who is an important political counsellor in Europe, is one of Georgia’s old friends. We always share our concerns on burning issues, and this is how we achieved the EU Association Agreement. Our Polish friends play a leading role in internal Georgian policy too. It is wonderful that the Polish business sector has become interested in the Georgian economic and business environment. 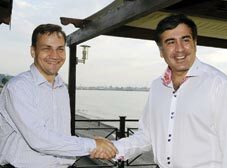 We want not only Polish officials to visit our country but tourists,” Saakashvili said, stressing that Poland is the only country in Europe with a developing economic environment while Georgia is definitely the only state in this region with great economic success. Sikorski expressed his hope that Poland will continue to have friendly relations with Georgia in the future, saying that Polish tourists will become fascinated by Georgia and start visiting the country to relax. “Each Polish citizen has understood the difficulties you overcame to attend the funerals of the late President of Poland and his wife and saw this as a sign of respect from your side,” Sikorski said, stating that his country has the best relations with Georgia. “Poland supports Georgia’s territorial integrity and the work of the EU Observer Mission. We are also really glad to sign the EU Associated Membership Agreement and we are among the countries supporting a visa liberalisation policy vis-a-vis Georgia,” Radoslaw Sikorski stated.